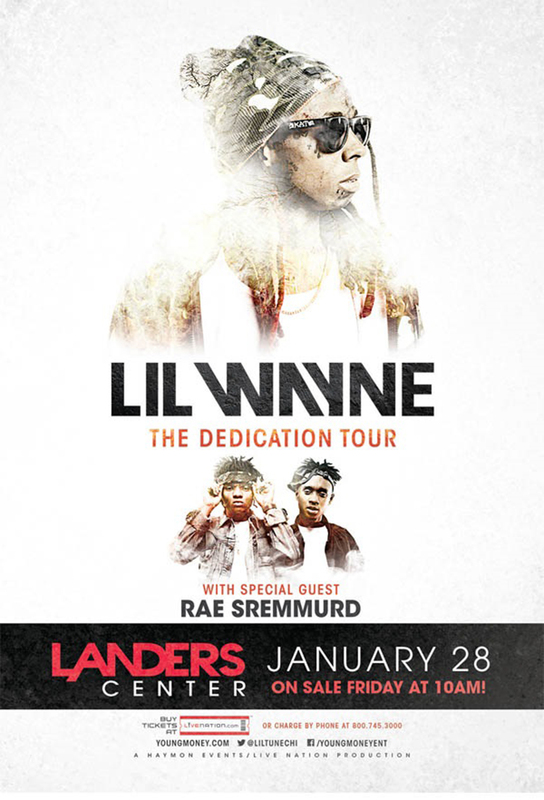 Lil Wayne Dedication Tour consist of hip hop music superstar Lil Wayne with special guest Rae Sremmurd. Tickets sales began Friday, Dec. 4, 10:00am. Lil Wayne’s solo debut album Tha Block Is Hot (1999), was certified platinum by the Recording Industry Association of America (RIAA). His subsequent albums, Lights Out (2000) and 500 Degreez (2002), went on to be certified gold. Wayne reached higher popularity with his fourth album Tha Carter (2004), which was led by the single “Go D.J.” and his appearance on Destiny’s Child’s Top 10 single “Soldier”, that same year. The album was followed by Tha Carter II (2005), as well as several mixtapes and collaborations throughout 2006 and 2007. Wayne gained more prominence with his sixth album Tha Carter III (2008), which became his most successful album to date, with first-week sales of over one million copies in the United States. The album won the Grammy Award for Best Rap Album and includes the hit singles “Lollipop”, “A Milli” and “Got Money”.